Each year, Ready Nutrition puts out an extensive list on some of the most popular prepping gear out there. Check out our list for 2016! Who’s ready for Cyber Monday? I know that many of you are starting to make wishlists for some favorite products to add to your prepping supplies and we’d love to help you out with that. Each year, Ready Nutrition puts out an extensive list on some of the most popular prepping gear out there. 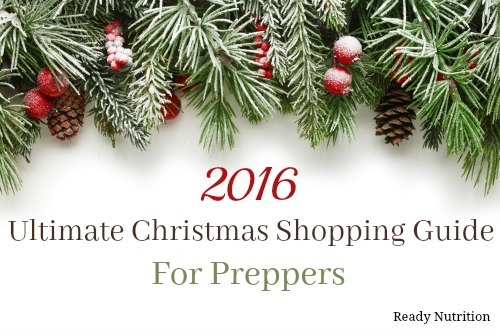 Here are some Prepper Christmas ideas from recent years: 2013, 2014, 2015. These online deals may inspire you to snag some for yourself and bulk up your own preps! Slingshots have long been used for hunting small game, such as rabbits, doves, and squirrels. An advantage of this is that it does not require ammunition, making it ideal for teaching kids about self-reliance. In a shtf situation where you have run out of ammunition, this modest weapon could be converted into a more powerful tool. You can read more about the effectiveness of this silent weapon here. This 462 page best-seller is a must-have for your prepper library. Each chapter uses real-life scenarios to help the reader prepare for any disaster and provides lists of supply suggestions. The well-rounded, multi-layered approach outlined in the Prepper’s Blueprint coaches the reader to make sense of a wide array of preparedness concepts through easily digestible action items and essential supply lists. The Mini Water Filter is the lightest and most versatile personal filtration system from Sawyer. It weighs 2 ounces and fits in the palm of your hand and allows you to drink from virtually any body of water. It may be small is size, but it allows you to drink up to 100,000 gallons of water without changing the filter! For less than $20 dollars, this is the gift that keeps on giving! Another great off-grid appliance to consider is mobile washing machine. We all know how dirty things can get in an emergency and having a way to keep clean will be paramount. Can also be used for small loads for single people and can wash 7 to 8 dress shirts, 10 T-shirts, 30 pairs of socks or 2 pairs of blue jeans per load. After finishing your washing cycle just attach the drain spout and it will automatically drain into the sink or bathtub. Then fill again with clean water for the rinse cycle. Turn your cellular phone into an off-grid communication tool. This state-of-the-art cognitive digital radio creates its own 100% off-grid signal and coordinates with other units within range so you can text privately — 1-to-1 or with a group — or broadcast openly to any nearby goTenna. It even has apps included with detailed offline maps — free to download for any region in the world — so you can locate yourself and others while enjoying the outdoors, travel, and crowded events or even during emergencies. Colt products are an American tradition built upon a lifetime of quality products. These arrowheads are the perfect addition to your survival kit and can be used for hunting, trapping, cutting, and even skinning. This tactical gas mask was originally developed for military and law enforcement use and is now available to civilians. This advanced breathing protection device is rated to protect against all CBRN (chemical, biological, radiological, and nuclear)-level threats and would make a great addition to your preps. The greatest sell point for Top Tier Gear USA is they take into account the family aspect of preparedness and have deals for families! There’s no doubt about it, this outdoor wood stove is built to last. With heating and cooking capability, it’s the ultimate “dual threat.” Perfect for camp, outbuildings and more. This well build outdoor stove keeps coffee and sauce pans hot, brings water to a boil and cooks bacon and eggs! The top selling point of this product is its portable and make from high quality galvanized steel. Multi-tools are just plain awesome aren’t they? They let you save a ton of space by wrapping multiple functions into a single item. And since most little problems don’t need super specialized solutions, a few multitools can fix pretty much any problem around the house. The Oht Black Molle multi-tool is stainless steel leatherman and truly has it all. Black oxide is a powder-based metal coating and is ideal for situations where giving away a position would be costly. This it is widely used by the military for its effectiveness in reducing glare and reflection. Also, don’t forget to add a tool holster for easy carry. VSSL supplies contain the outdoor gear you need for short-term excursions. Whether you plan to be out for a few days or a few hours, having critical supplies in a compact weather-resistant case is an essential part of preparation. This is a great product to keep in your bug out supplies or in your vehicle preparedness kit. I love this product because everything is labeled so you stay organized when you’re on the go! Off-gridders are going to love this product! The Wonderbag is a simple but revolutionary non-electric, portable slow cooker. Wonderbag’s clever insulation allows food that has been brought to the boil to continue slow cooking or warm while in the bag. No plugs. No Fuss. No electricity required, so it’s worry-free. This is a great addition for those wanting alternative ways to cook when there is an off-grid emergency. Looking for a more personal gift? Homemade gifts also make wonderful presents to put under the tree. There is still time to make a homemade gift for loved ones. Here are some that I or the writers at Ready Nutrition have written about in the past. How to Make Homemade Soap – The Easy Way!